Picking furniture is always a tricky task; from design and comfort to sturdiness and size, everything has to go right in order for the buyer to feel satisfied. What type of frame supports the sofa? What kind of foam has been used in filling the cushions? These are essential questions that the sofa buyer must ask oneself before completing a purchase. Corner sofas are becoming popular because they are incredibly versatile. They can be used either on one side of a room in order to tie together other parts of a set or as a single piece, giving the user the ability to get creative. This freedom of placement and usage makes it a very interesting and elegant addition to any living room setup. With that in mind, one of the corner sofas that have caught our attention is the one manufactured by Modway. Thus, we have evaluated it to help you decide whether to invest in it or not. CONTEMPORARY STYLE - The roomy depth and iconic look of Empress showcase mid-century modern design. Boasting tailored lines and a hopeful style, this piece embodies retro intrigue and sophistication. FINE UPHOLSTERY - Upholstered in quality polyester, Empress emboldens décor with a design worth remembering. This distinctive collection makes for a striking statement brimming with possibility. MODERN LOUNGE SPOT - A cherished tufted button seat for lounge spaces of all types, Empress provides an elegant place to rest when delving deep into conversation or sipping a steaming cup of tea. SUPERIOR CONSTRUCTION - The focal point of any room, Empress is expertly crafted and sits atop tapered solid wood legs with non-marking caps. Make your living or lounge room memorable with Empress. Modway is a USA-based distributor of various types of furniture, all with a revamped mid-century design. They are constantly updating their portfolio and keeping an eye out for exciting new takes on the classic designs. It is an exceptional company that only sells quality products. The Empress Fabric Corner Sofa model is part of a big set, complete with benches, armchairs, ottomans and more. It is said to be an amazing choice for anyone looking to add a bit of elegance in their household. The overall tone of the Modway Empress Fabric Corner Sofa is a modern mid-century adaptation of the classic sofa style, which is a great choice on the designer’s part since it is easy to pair it with other pieces of furniture. It has a total dimension of 36 (L) x 36 (W) x 35.5 (H) inches and a seat length of 22.5 inches and height of 18.5 inches. As per its weight, it is at 52 pounds, which means that it requires at least two individuals so that you can set it up in the room without hassles. This piece of furniture has been upholstered using carefully selected, high-quality polyester materials. It comes in ten different color variants including light gray, gray, granite, azure blue, laguna blue, and sunny. As recommended, the neutral gray goes best with blue, purple and green interiors since the contrast makes it pop out. In more pale environments, stronger colors will be best suited as they will break the theme and bring more attention to this piece of furniture. The backrest of this item has evenly distributed buttons to enhance its look. In addition, it has solid wood legs that are equipped with non-marking caps, which means it can be placed on any type of floor, whether carpeted or hardwood without the danger of causing damages on the surface. The thickness of the sofa’s plush cushioning is well-balanced that makes it comfortable and firm enough to provide adequate support to the user. Overall, it’s a very cozy place to sit or curl in. In addition, the sturdy wooden frame allows this one-seater to hold up to 440 pounds of weight. The Modway Empress Fabric Corner Sofa is a sturdy and elegant piece of furniture that is available in different colors that can match any interior design. With its mix of modern and classic design, it can be added to your current set of furniture, or you can purchase it together with the armchairs, benches, and ottoman seats offered by the same company. Although the buttons placed in the backrest might come off after some time, the frame, upholstery, and cushion can last for a long time. In fact, it can accommodate an individual with a weight of 440 pounds. In addition, you would not worry about scratching your flooring since the legs have caps. Lastly, you can place this sofa in the right or left corner of your room without looking out of place since it does not have any armrests. The furniture market is nothing but vast, and it’s hard for someone who wants to bring a little pizazz to the household to make an informed decision. 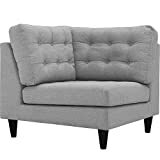 Whether someone is looking for an armchair, a sofa or a corner sofa, the same problems arise with each particular product, which is very frustrating for the online shopper. In order to ensure that you have the chosen the right product, we will compare the Modway Empress Fabric Corner Sofa with the Homelegance Deryn Mid-Century Modern Chair as both come in at a similar price and mid-century fresh look. To add, they also come in bland colors, are part of bigger sets, and are elegant looking. The Homelegance Deryn Mid-Century Modern Chair is also made of a solid wood frame and has rubberwood legs that will not scratch your flooring. However, the foam mattress or cushion tends to lose firmness after a couple of months of use, turning into an uncomfortable, saggy mess. Further, it can only accommodate a maximum weight of 300 pounds. 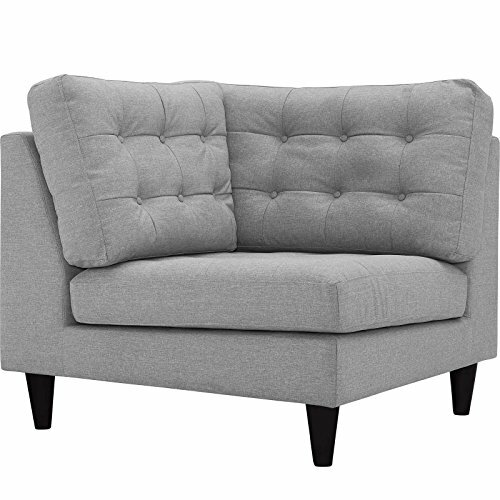 This also comes with armrests which limit the number of placement choices. In contrast, the whole beauty of the Modway Empress Fabric Corner Sofa is that, besides the superior build quality, it brings a whole new level of customization options for the user to enjoy. Ultimately, this corner sofa goes well in any room and any position. In addition, the availability of different color variants and the freedom it offers through its design makes it an incredibly versatile piece, suited for any home and office out there. All in all, we consider the Modway Empress Fabric Corner Sofa as a great investment. Either purchased individually or together with the other great products from the distributor, it brings the three best things that a user needs: reliability, comfort, and durability.